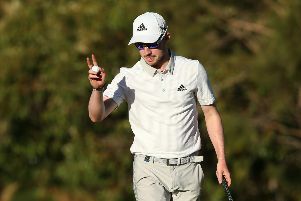 England’s Ashley Chesters remained the man to catch in the Andalucia Masters, despite not hitting a single shot on a second weather-affected day at Valderrama. After four hours were lost to stormy conditions on Thursday, two further delays yesterday meant half the field, including Chesters and defending champion Sergio Garcia, had yet to begin their second rounds. Play was due to resume at 0910 local time (0810 BST) today but with more bad weather forecast, the tournament could be extended until Monday or reduced to 54 holes. The European Tour will be keen to complete as many rounds as possible as the £1.7 million event is the last chance for players to reach the top 116 on the Race to Dubai and secure full playing privileges for next season. Scotland’s Marc Warren, who began the week 144th on the money list, is a shot off the lead after playing the first nine holes of his second round in two under par, with France’s Gregory Bourdy alongside Warren on four under after an opening 67. Home favourite Gonzalo Fernandez-Castano is in a five-strong group on three under after seven holes of his second round, but will return to an eagle putt on the par-five 17th when play resumes. Fellow Spaniard Alvaro Quiros and Welshman Oliver Farr were also on three under in the early stages of their second rounds, alongside Garcia and Australian Jason Scrivener, who were due to start their second rounds on Saturday. Warren, whose sole top-ten of the season came in the Spanish Open in April, said: “I’m hitting the ball as well as I have in a long time. I gave myself a lot of chances and I’m doing what you’ve got to do around here, which is hitting fairways and greens.